Steel floor deck sheet is rolled by WLFD series steel floor decking roll forming machine, the finished products are of many features, such as simple shape, large wave height, high intensity and good adhesiveness when pouring the concrete together with the welded steel wire net on-site. In the high-storey building, it not only can save steel mould board, but also reduce the bearing of the floor; on basis of equal capacity, it reduces the steel amount of engineering useage, so that it saves cost of investment. 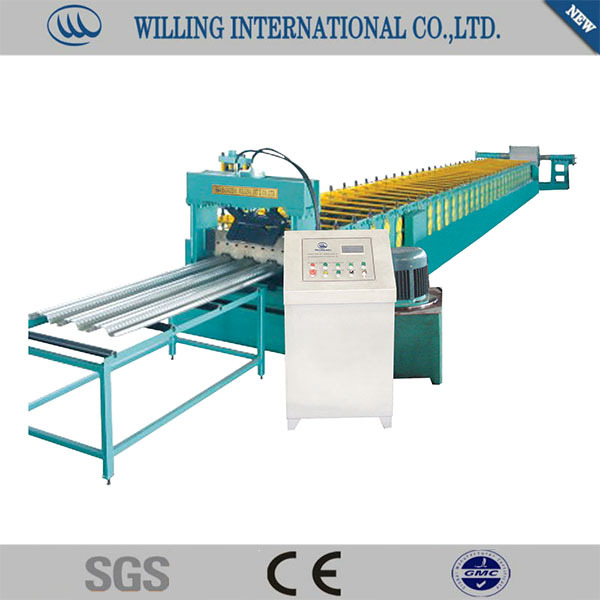 WLFD series steel floor deck roll forming machine consists of uncoiler and its base, infeed guides, fixed position driven forming stations, shearing device, hydraulic station, PLC control console and so on. Our company has dozens of profile models for this series roll forming machine, such as WLFD66-225-675, WLFD76-344-688, and etc. We can design different kinds of profile and fittings for downpipe machine, as per customers' requirements.